Recently I cranked up the standards a bit. 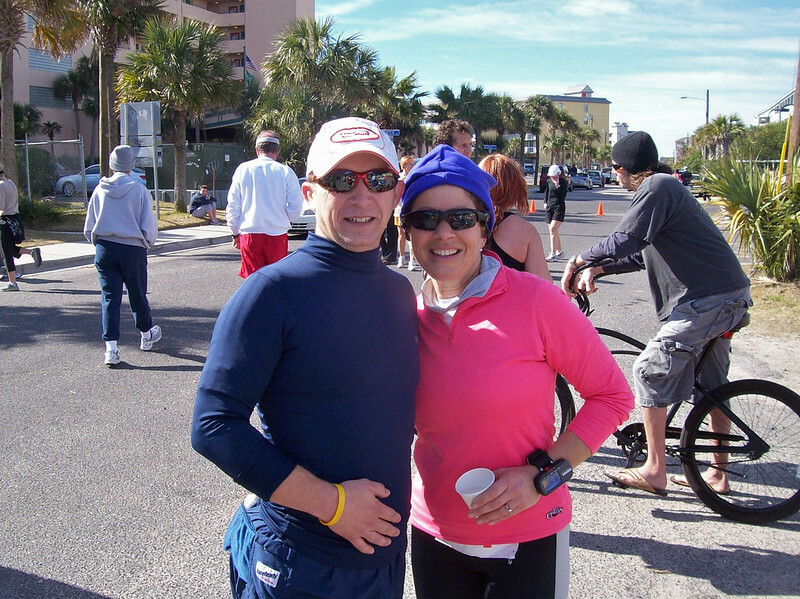 I participated in the Save the Light Half-Marathon, running 13.1 miles back and forth through the neighborhood around Folly Beach, South Carolina. The goal of the event is to raise money for the local lighthouse. You can get more details at the official website for the event. It was a big deal for me, since I had never run more than 12 miles in my entire life. Even worse, working two jobs and moving into a new apartment kept me from training very much in the weeks before the race. (As excuses go, those are pretty good.) I knew I was in for an exhausting event, so I made some time and ran 8 miles about a week prior to the event. 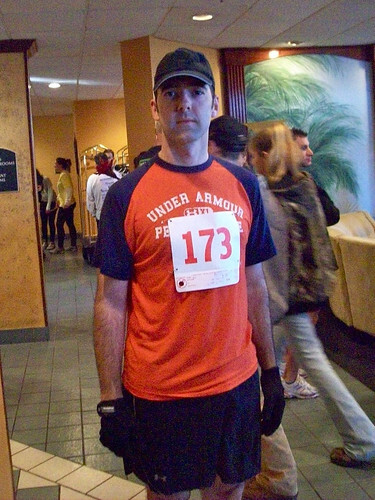 I felt just fine, so I gambled that 13.1 miles wouldn’t be too much harder than 12. It was an easy drive to Folly Beach from my new apartment downtown. At 7 o’clock on a Saturday morning, Charleston is pretty quiet. I pulled some Google directions just to make sure and headed out. Folly was pretty, and it was nice to see the lines of palmetto trees. I wasn’t a fan of the temperature, however. The morning chill hadn’t worn off yet. I immediately knew which hotel I needed to register at, because that Piggley Wiggley mascot was hanging around. I can’t help but wonder if that job is a blessing or a curse. Did he (or she) compete for the chance to wear the suit, or is it the kind of job you get after you make the manager very, very angry? Whatever the case, the suit looked warm enough. I entered the hotel and did the best I could with my crappy Kodak point-and-shoot. Once again, I told myself that I would replace it and once again I debated over whether it’s better to have a camera that takes great photos on the run, or a camera I won’t cry over if it gets rained on and stopped working. Sadly, there were no t-shirts left for those of us who didn’t pre-register. I couldn’t even get a poster, because they didn’t make any for this year’s event. I was a little bummed, but it’s not like they didn’t warn me on the website. I guess they had trouble in previous years with storing all sorts of extra shirts. Some folks were still wearing layers, but I knew better. I ditched the heavy stuff, stripping my winter gear down to the bare essentials… gloves and a hat. I knew that the morning chill would wear off, and that our bodies would warm up after a quarter-mile anyway. 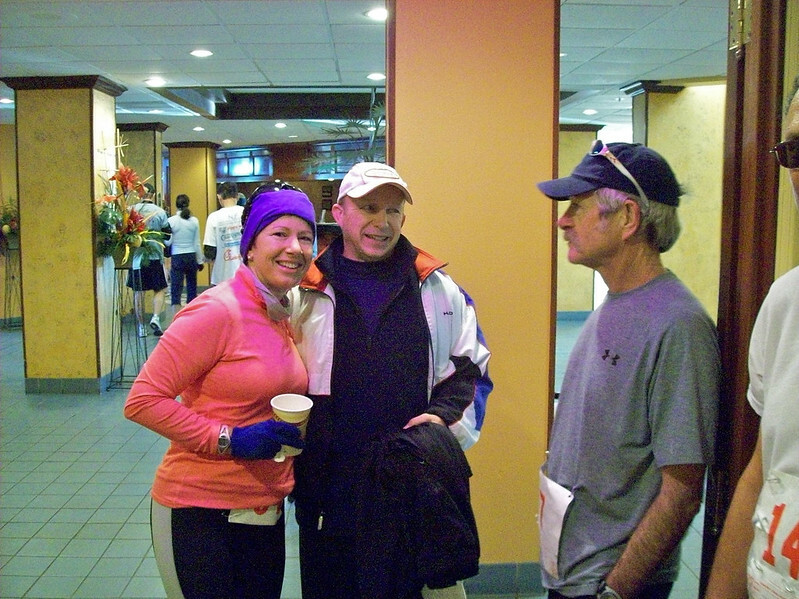 I wouldn’t be cold, but these folks in the sweat gear would be… well, sweating. When you do a lot of these events, you start bumping into the same people again and again. So far, it’s been a completely positive experience. Everyone is working to improve themselves. Everyone is a winner by participating and doing the work. It’s enough to break you out of any funk you may happen to be in. Above you’ll see Monica and John, two friends of mine from almost all of the events I’ve done in Charleston. They’re both trainers and they’ve both run multiple marathons. John is currently recovering from knee surgery, so he wasn’t running in the half. Honestly, it’s been kind of sad to see him rooting for us from the sidelines when he desperately wants to get out there with us. I suppose that’s why he had run in an 8K event the week before the half-marathon, much to the annoyance of his doctor. The Folly of the Automobiles. A few notes about the course. First of all, this neighborhood just isn’t big enough for a half-marathon. The 5K route was nice, but after we split off from them we just wound back and forth around the neighborhood. I was constantly passing people who were at an earlier part of the course. We went up local roads only to turn around at a traffic cone, just to add a little distance to the map. Seriously, I think we ran along every bit of surface area the town had to offer. It seemed less like a half-marathon and more like doing laps around a neighborhood. In addition to all of that, the course was unsafe. On several occasions we shared the road with automobiles. 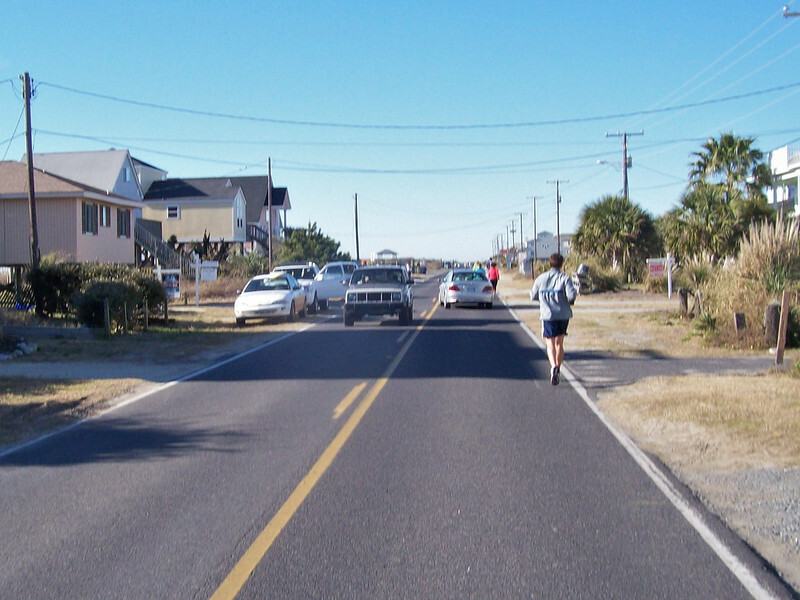 Look, I understand that Folly Beach has a lot of rich people and beach houses, but for a half-marathon I think you can properly shut down the streets for three hours. Even beach residents are capable of waiting for a little while. Not only did several cars and trucks pass, but I ran past a house where college boys were standing beside a gigantic pickup truck and planning a beer run. Even though the vehicles were driving slow, they were still driving on the same road as people who are exhausting themselves. The photo below is unacceptable. It’s just wrong, and it will factor into my decision to participate next year. After I saw the cars, it took me a while before I could focus on the race again. I’ve seen more reckess driving in Charleston, South Carolina than I ever have in Atlanta, Miami, or even New Jersey. I spent a couple of miles looking over my shoulder. As I approached the tenth mile, I was really starting to feel the exhaustion. My heart and lungs were happy to keep up the pace, but my legs were protesting, writing letters and asking to see a manager. I kept going by talking to various people along the way. Sometimes I was faster so I would push ahead after a few minutes, but as the miles went by I found myself to be the slower runner in every pair. Everyone I paced with had run at least one marathon. I would like to express my gratitude to Sue for the early miles, Jenny for miles six through eleven, and Sandy for the final stretch. It’s good to have someone to run with, and to keep me from slowing down to a walk. For the last two miles, I ran with a woman named Sandy Austin. 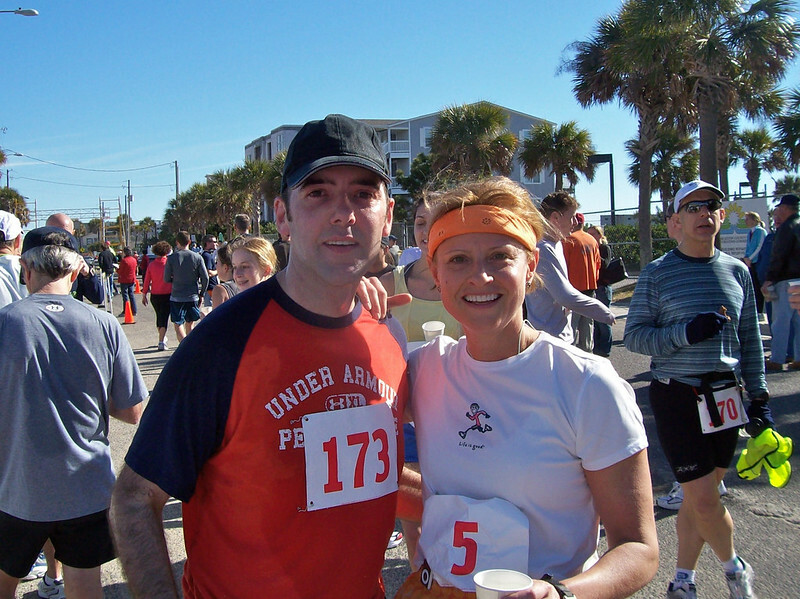 She’s run several marathons, and has a wonderful attitude. She was just cruising along, so I was able to keep up with her pretty well. When we passed the 12-mile marker, I told her that I was going farther than I ever had before. It was uncharted territory for me, but I didn’t want to stop or walk. Thanks to her conversation and encouragement, I was able to maintain the pace. This is where you really learn about yourself, to be honest. We are at our best when we push through the hard stuff. As I approached the clock I decided to punch it. I left Sandy behind an ran with everything I had left. People were cheering as they always do when somebody works hard at the end, and I went into a sort of trance. I was snapped out of it by a solidly built man in the finishing chute who held out his hands and told me to slow down. I had passed the clock and I was still sprinting directly towards those nice people who take your race number’s tag at the end. I obediently dropped my speed, and found myself completely spent as I exited. Someone asked if I was alright, but I only responded with the clock time I was trying to memorize. I finished in 2 hours and 17 seconds. Not bad at all for a first half-marathon. Below, you can see me with Sandy just moments after the race. I looked and felt like a train wreck, so I made my way over to the tables and mooched as much free fruit, water and cookies as possible. In spite of the cars on the course, I’m glad I did this. It’s a milestone for me, and I’m proud of my time. Furthermore, I’m proud of the people I meet at every event. Everyone is a winner here, from the beginner to the pro. Sure, there are prizes for First Place, but the true victory is getting out there and finding out that you can go just a little farther, and do just a little more.